This entry was posted in চিত্রকথা, বাংলা কমিক্‌স, হাসির ছবি, Bangla, Bangla comics, Bengali comics, funny Bangla pictures, funny Bengali pictures, picture perfect! by Anirban. Bookmark the permalink. ha ha! good one! sathe arekta khomotao thaka chayi- he possibly has to have an opinion on everything ranging from international hostile neighbours, domestic political parties spreading hooliganism to kosha mangsho, rahaman’s grammy win and shyalok’s iit preparation. 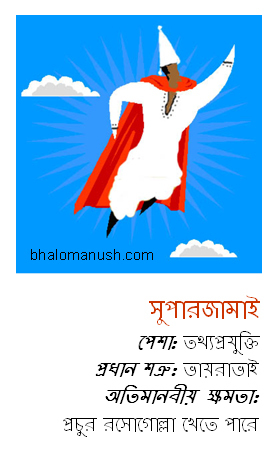 Superjamai also has a “day of worship” known as Jamai-Shasthi.